Balcony in the north wing. From the first moment that the monastery comes into view for pilgrims descending the rough road leading from Karyes to Pantokrator, its buildings give the impression of a well-fortified castle, with its imposing battlemented tower dominating the whole area, while its outer walls seem to try to hide and protect the katholikon and the other internal buildings. This obviously defensive arrangement, reminds one of the historical adventures of Pantokrator (and the other Athonite monasteries) which, at critical stages of its life, and in particular during the period of Turkish rule, was confronted by various enemies and raiders. As a result, it is now thought that the only original buildings preserved are those on the north-west side of the present day complex, the katholikon and the surrounding monastic cells. The extensions to the south-east must be dated to somewhere between 1483 and 1535. 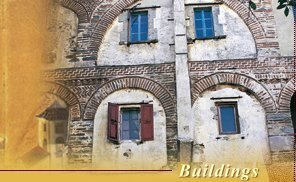 This can be gathered from recently discovered evidence that confirms the accounts of Barskij and Komnenos according to which “the new courtyard” of the monastery was a project of Barbulu. 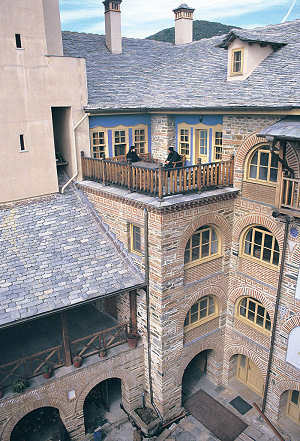 The individual buildings do not rise to more than three storeys and they are distinctive for their massively-built arched galleries and abundant ceramic decorations on the inside, as well as for their balconies and projected galleries on the outside which provide a magnificent view of the open sea and the steep peak of Athos. At the south-eastern corner of the enclosure is located the main entrance. Above it is a small square tower with the chapel of St Panteleimon housed on its top floor. This tower was also furnished with a parapet and cannons that are depicted in old engravings of the monastery. 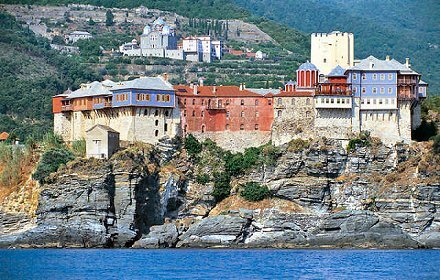 View of the monastery and the skete of Prophet Elijah from the sea. In front of the monastery’s entrance and attached to it, a four-columned arched porch has been constructed, on the right of which the visitor can see a marble fountain placed there during the renovation works of the eighteenth century financed by Sacristan Cyril and George as can be gathered form a relevant inscription on it. (The wisdom of God, according to Solomon, calls, “Come and drink my drink for the soul,” and this spring cries out to all who are thirsty, “Come and drink this sweetest drink for the body, prepared for you by the toil and at the expense of Sacristan Cyril and George. But now as you enjoy this earthly running water make a wish that they may be rewarded with the heavenly nectar. A few metres to the south of the porch, on the edge of a steep cliff, stands a square wooden kiosk that has been there at least since the time of the drawings made by V. Barskij in 1744. From that vantage point the visitor has a unique view of the sea, the nearby monastery of Stavronikita and on the horizon the rocky summit of Athos. On entering the monastery, the visitor finds himself in a courtyard that slopes up gently towards the north where the katholikon stands. This was originally in the centre of a courtyard. At some point, probably in the middle of the eighteenth century, another smaller and connecting courtyard was built. According to Barskij, visitors passing through the main entrance first found themselves in this small courtyard. The two yards were separated by a wall so that the monks could be isolated from the technicians and workers who lodged in the rooms surrounding the small courtyard. Today most of the quarters surrounding the katholikon have been renovated or are in the process of being renovated. The exception is the east range which was reconstructed by the Archaeological Service after the devastating fire of 1948 when it had been reduced to ashes. After the reversion of the monastery to coenobitic status, the guest quarters in that wing were restored, as was the large room at its southern end which was converted, at the expense of the entrepreneur Mr V. Theocharakis, into a salon where pilgrims could gather and meet. View of the snow-covered west wing. It is worth noting that in the basement of this wing an earthen cask is preserved that is related to the miracle of the flowing oil connected with the icon of the Blessed Virgin Gerontissa. In the west wing, the restoration of which has almost been completed, there is the kitchen (its construction dating from the sixteenth century), the refectory, the chapel of St John the Forerunner, and some cells for the monks. Earlier restorations of parts of this wing in the years 1637 and 1776 are evidenced from inscribed tablets attached to its outer walls. The south wing is now in its final stage of restoration. 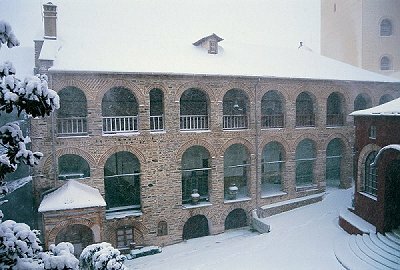 Housed in this wing in the past were the abbot’s chambers, the refectory, the guest house (archontariki) and some cells for the monks. On completion of its current restoration, it will house a meeting room, a number of public reception rooms and the chapel of St Nicholas. Outside the monastery, to the north and west, are several dependent auxiliary buildings and kathismata erected at different times as well as two aqueducts, one to the north and another to the south of the monastery. The first, an aqueduct of the Byzantine type with arches, was most probably constructed when the monastery was founded. A marble inscription set at the base of the stairway leading up to the refectory mentions a restoration of this aqueduct in 1537 by Totrousian, the Great Logothete of Moldavia. According to another unpublished marble inscription, which today is kept in the monastery’s library, the construction of the second aqueduct dates from 1780. At a short distance to the west of the monastery there is a garden with a chapel of St Tryphon surrounded by olive trees and the cemetery with a chapel of the Anargyri. Near the small harbour can still be seen a well in which the monastery’s icon of the Blessed Virgin Gerontissa lay hidden for almost eighty years.